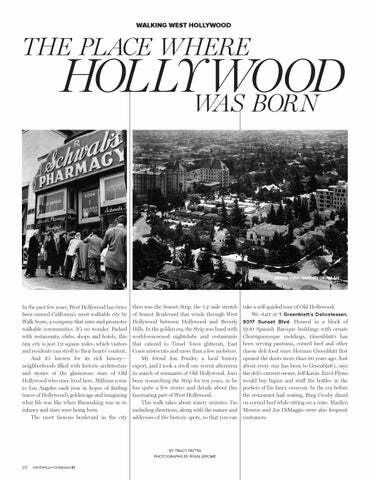 take a self-guided tour of Old Hollywood. We start at 1. Greenblatt’s Delicatessen, 8017 Sunset Blvd. Housed in a block of 1930 Spanish Baroque buildings with ornate Churrigueresque moldings, Greenblatt’s has been serving pastrami, corned beef and other classic deli food since Herman Greenblatt first opened the doors more than 80 years ago. Just about every star has been to Greenblatt’s, says the deli’s current owner, Jeff Kavin. Errol Flynn would buy liquor and stuff the bottles in the pockets of his fancy overcoat. In the era before the restaurant had seating, Bing Crosby dined on corned beef while sitting on a crate. Marilyn Monroe and Joe DiMaggio were also frequent customers.